Hydraulics From tractors to wood splitters, fluid power lives here. I know you wanted to move the conversation over to your other thread. But will you report (down the line) how the Buna-N spider holds up. I mounted an aux pump off the end of the crankshaft and used the higher torque (harder) spider. Maybe it was overkill and if I ever need to replace it, it would be interesting if the softer one holds up to the torque. Thanks, and good work! I took another look at your setup and it begs the question: should I eliminate the entire double-pulley setup and mount the pump directly on the engine output shaft? The double-double pulleys appear to be the same size, so there's no change in rotation speed. I 'think' the tension pulleys are also for disengagement of the lower PTO, although I can't see the lever or cable to move it. The downside is the lower pulleys drive a single PTO shaft to both front and rear. I assume the rear is for a mow deck belt. It would eliminate two PTO's. I'm really a newbie at this and need to take a closer look. Added: The cable for releasing the tension pulleys is obvious and in the photo.... I'm going to leave this setup as it provides more options for the tractor - and - is original to the design. Last edited by ToasterTan; 03-27-2019 at 02:01 PM. Until GPJ checks in, I'll take a stab at some of these questions. Belts: I think you want solid V-belts instead of what you bought. I'm not as familiar with the 400's PTO arrangement. But it looks like an engine PTO/pulley drives dual front/mid-PTO splines, with a tensioner pulley that engages it. The mid-pto (the rearmost of those two that are driven by the pulleys) would use a shaft to drive the mower deck. I think your best bet is to stick to the plan of attaching the lovejoy to the splined-shaft front-pto. That way you can disengage/turn-off the pump if for some reason you need to. Those belts are good. They're not cogged, the scallops add flex, a good thing when using a idler to tighten a short belt. GPJ went straight off engine. His pump mount looks really sturdy. I don't have a picture right now, but I did both on a Sears, belt drive and pump mount. Girls with large lawns like a guy with a really big deck! Thanks for the info. I'll give them a try! Mounting a pump on the crankshaft end was really my only option to build a dedicated onboard system. As long as your 400 is a dedicated FEL/hoe platform, using the pto makes a lot of sense. Especially if the controls are loader mounted and the uprights are the tanks. It's a little tricky to get the belts to slip when the pto idlers are disengaged. Pay attention to the "snubbers" on each side of the drive pulley. Also there are 2 pins/rods that stick out of the lower front plate, IIRC. Both of those are pretty critical to getting the belts to disengage enough that the PTO doesn't run with the belts dragging slightly. There is a brake but I wouldn't count on mine actually working. At least my deck and thrower just wind down without any apparent braking. I suppose I should fix that. 1981 JD 400 K582. 60 deck, SSQA 50 snowblower, suspension seat, left side brakes, 2 pedal foot control, H5 with separate deck lift and 3PH. Home made 3PH, mini SSQA loader, landplane, 10 weight capacity hitch, stacking starter weights, fender extensions, LED lighting. I plan to install quick connects on the feed lines to both FEL and backhoe so they can be removed without draining the system. The tractor came with a 2-cylinder front blade, which they never used. The fluid reservoir is in the FEL arms, which is an issue if I want to remove the FEL and mount another attachment. I haven't looked to see if the bucket can be removed and the arms moved back and/or up so a blade can be mounted. Photo below. There are 4 hydraulic couplers on the front of the tractor, one of which is cut and pinched off. I suspect it leaked or was damaged and that was the 'cure'. I'm going to restore them to operational. I will also have to look at routing or adding lines so an attachment can be removed and the others remain operational. 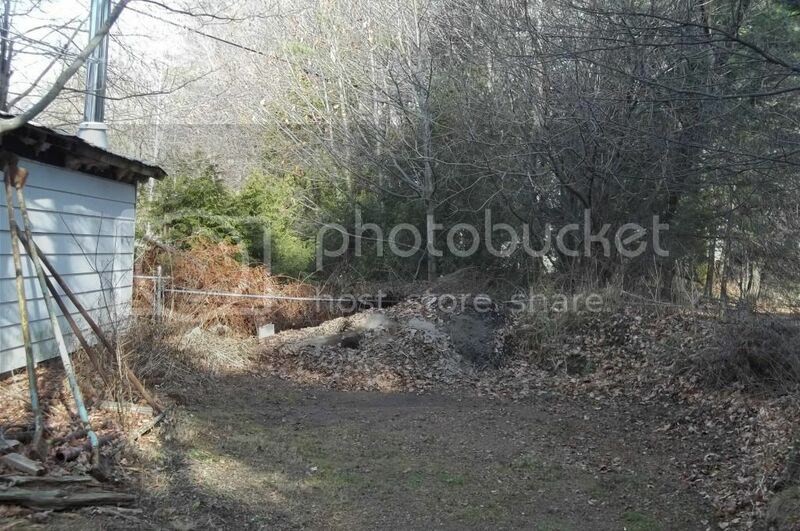 Ideally, I would like to fabricate a stand which can be backed in to and the backhoe removed. I also have a 42" rototiller with it's own reservoir and pump. 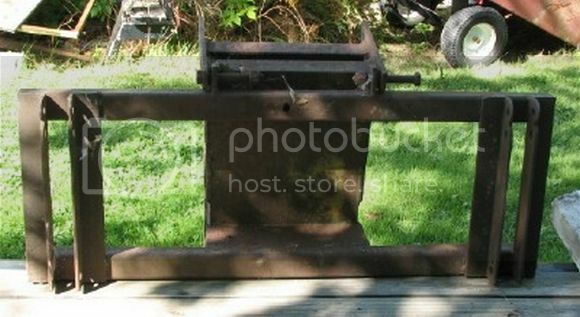 Currently, it has a belt drive which was made to go under a large rider mower. Perhaps it can be revised to use the rear PTO on the front pulleys. Last 2 photos. Do folks mount an auxiliary tank for operation without the FEL? When you dismount the FEL, you will lose your external hydraulic reservoir for the backhoe. So the hoe will be non-functional at that point. Usually the pump dismounts with the backhoe, too. Your front blade will operate off your tractor’s domestic hydraulic system, which works off a separate pump in the hydrostatic transmission and draws from the transaxle reservoir. Fix the damaged couplers and hoses, then mount the blade, connect the couplers, and you’re set. The FEL pump/reservoir is unrelated. Your hydraulic tiller is another story. It essentially has its own separate dedicated pump and reservoir, just like the FEL/backhoe. In theory you might be able to run that tiller off your FEL pump system, but the flow and pressure need to be matched correctly. GrandpaJay has created a parallel domestic hydraulic system that stays on the tractor and is always available to power various attachments requiring more pressure and flow than his hydrostatic transmission provides. But GPJ is a gifted designer and fabricator, and replicating his system requires quite a skillset! The backhoe uses the FEL reservoir and pump, which is the issue the PO bought the new pump to fix. However, he failed to factor the ancient oil and amount of water spoog in the system, which made everything operate mushy at best. I'm happy to have a new pump out of the deal and want to refurb/design the system so everything will operate correctly. I understand the blade uses the domestic pump. It was whether the FEL could be moved out of the way for it to attach. I think the mount has the blade out far enough were it will work with just the bucket off. I may even be able to fabricate a couple of brackets to hold the FEL arms up in place. I may ping G-Jay to find out what tractor his system is on. Also look at the concept to see if this one would benefit. Oh, I guess I misunderstood what you were asking in the previous post. And yes, the BH uses the FEL pump and reservoir, so would be out of commission without it mounted. But normally you would not want the BH mounted without the FEL to counterbalance the weight, so generally speaking you would not be using the BH without the FEL in place. At any rate, I don't think you'd be able to mount the front blade without removing the pump mount first. I suspect there will be interference. I sure can appreciate the process you are going through noodling the options. And you have the wonderful complication of having a backhoe!!! I'm jealous. I plan to install quick connects on the feed lines to both FEL and backhoe so they can be removed without draining the system. The tractor came with a 2-cylinder front blade, which they never used. The fluid reservoir is in the FEL arms, which is an issue if I want to remove the FEL and mount another attachment. I haven't looked to see if the bucket can be removed and the arms moved back and/or up so a blade can be mounted. If you remove the FEL, the pump is also removed due to the reservoir being in the posts. Adding an extra reservoir can create problems if the pump is to be left in place and operational. The fluid must have a continuous flow path from the reservoir to the pump and back to the reservoir at all times. To remove the back hoe, you need two sets of quick connects one for the feed to the back hoe valve set and the second for the return to the reservoir. The path for the fluid must be continuous from the pump to the reservoir or the pump will be damaged. General schematic. "X" marks the quick connects. Back Hoe valve set inlet port _______X______ Back hoe return port. Shut off the engine when disconnecting/reconnecting the lines. 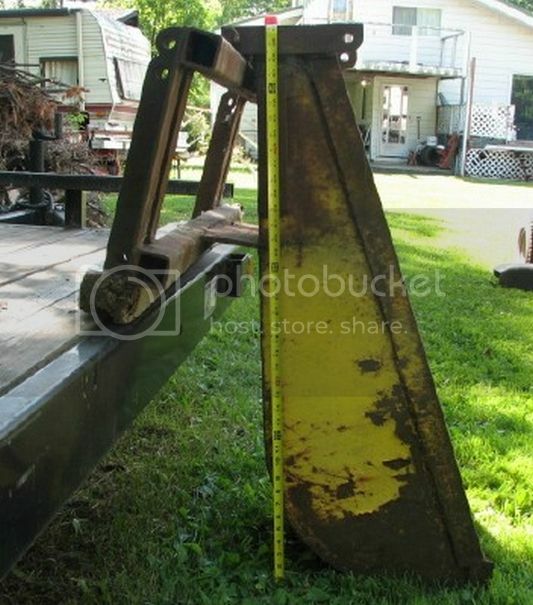 The nice thing about a hoe is that it has two stabilizers and a bucket to act as a tripod to lift/tilt the hoe off the tractor and lower to a dolly or stand before disconnecting the lines. To reinstall, reverse the procedure. I built my equipment shed so that the bottom of the hoe will just clear the floor when I back up to it. Then I can set it down and retract the stabilizers before disconnecting the lines. There are four options for the plow. 1) Remove the bucket and raise the FEL arms out of your sight line and install the plow as it was intended. Not the best option, but doable with little fabrication and work. 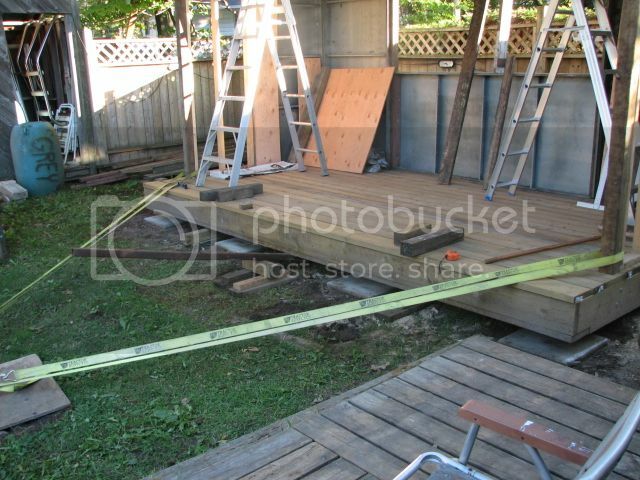 2) Make a frame to replace the bucket and install the plow on the frame. The frame can be made so that the normal plow harness can be attached and tucked further back under the arms to reduce the distance out front to the cutting edge and still allow the blade to be angled. This involves some fabrication, but once completed, little work to switch back and forth. 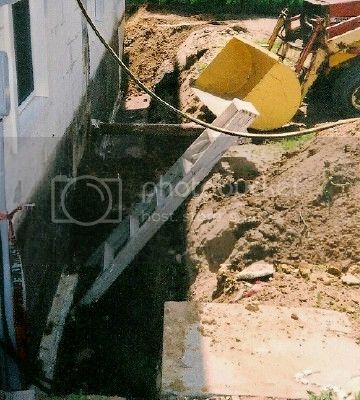 An example of the frame suggested that I used for a trenching bucket to replace the normal material handling bucket. 3) Remove the FEL (and pump) and install the plow as normal. For various reasons, I don't consider this to be a reasonable option. It's too much work and use of the FEL is lost while the blade is installed. 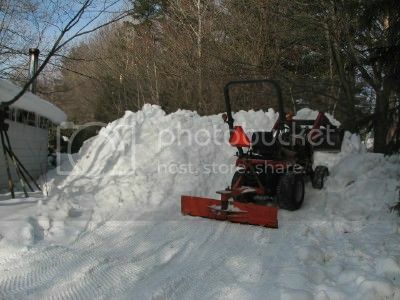 4) Build a bigger bucket and use the FEL for snow removal. This is the route that I chose for my GT and it worked well for 22 years in conjunction with a back blade. The disadvantages are that there is no angling with a bucket and a larger bucket is heavier. The advantage is that snow can be piled 7' high and the loader will chew its way through deep snow that will stop a blade dead. Winter, using my SCUT. The GT would actually pile it higher. There are only four pins involved to remove and install a bucket. I did it on a regular basis with various attachments for the loader. It takes me about a minute to drop the bucket, and 2 minutes, if the gods are smiling, to hook it back up. Five minutes if they are in a bad mood. Last edited by TUDOR; 03-30-2019 at 03:52 AM. WOWZA! Thanks to everyone for a front-loader full of information! G-Jay: Your 400 is barely recognizable! You've rebuilt the whole dang thing. What year is it? The FEL looks really different from mine - much shorter arms. It occurred to me to fabricate a blade mount to replace the bucket. It may be the easiest - and ONLY route that makes sense. I'm a fair welder and make a lot of stuff for my shop, among other things. I don't want to stray too far from the original 400 configuration, so for now it will be just assembling everything so I have a working tractor. Once relocated in Arizona there will be ample time to ponder the full refurb. Tudor: I understand the B-hoe hydraulics form a loop in the system and will look at how to best configure it. The feed/return hoses come from the FEL arm. I will either make a short connector hose at the B-hoe end or make the disconnect at the arm so it can loop right there. It may be I'm trying too hard to make a bunch of attachments work. Going to take a breath and ponder what makes the most sense. Just because I have it - doesn't mean it has to go on the tractor. The only other tool i'm going to make is a skid-steer for the FEL. Easy enough to make it snap on to the bucket mounts and a useful attachment for moving things about. As you pointed out, the bucket can drop off in under a minute. Right now I have a couple things to do around here before having to return the Kubota to my friend. I pruned my sister's 10 fruit trees, which is a LOT to chip! If you place the quick connects for the back hoe at the rear of the tractor, that gives you the option of installing a piece of hydraulic equipment (and control valve) on the rear of the tractor. I have a log splitter that goes on my 3PH that uses the FEL hydraulics, and the option of connecting a hydraulic tilt for my dump cart. You need the long runs of hoses for the hoe anyway, so the 2 sets of quick connects won't hurt anything at the rear. I don't want to post everything twice - so take a look. This will be the last post for this thread. I've moved back to the original topic of my JD-400 refurb. The new Kevlar belts were installed on the PTO pulleys, which proved the pump mount design. The hydraulic pump can be removed without disturbing the alignment to the PTO shaft. Just take out the two bolts holding it with the belt guard and pull it back and off. I wiped the excess grease from the output shaft left from installing the assembly, slid the pump coupler into the other half on the shaft, tightened the two bolts and did a quick check of the gaps to confirm they were even. No realignment and the pump hoses, if they were installed, would stay hooked up to the pump.